Warung Brintik is very much a typical establishment that can be found all over Malang. And by that I mean a relatively small, perhaps even pokey, building, furnished with long benches and continuous tables that force patrons and strangers alike to eat side by side, a place that offers only a restricted number of specialty dishes done really well, a place where locals can go for breakfast and lunch for a reasonable price. 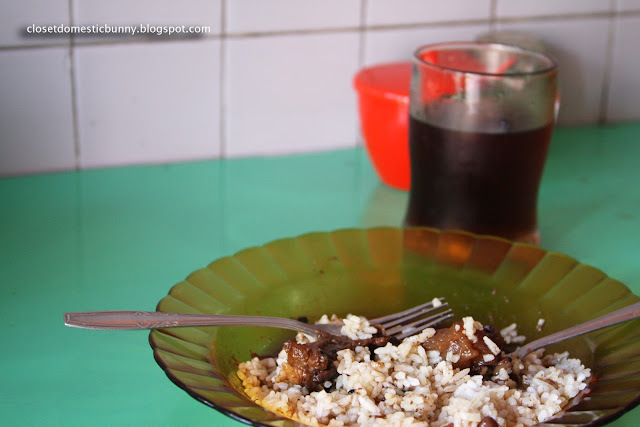 It is especially famous for its semur daging and rawon. When you order these two dishes together, you may be hard pressed to know which one is which at first glance. The colour of the two dishes are very similar, semur is more in the dark dark brown spectrum, whereas rawon is firmly in the black. The only other way to tell, except from asking the proprietor, is to taste it. Simple! Semur daging, is a javanese chunky beef stew that has been braised in a thick sauce laced with various types of spices. The name semur is derived from the Dutch word smoor (stew), providing clues that the dish was influenced by the Dutch colonials stewing technique. 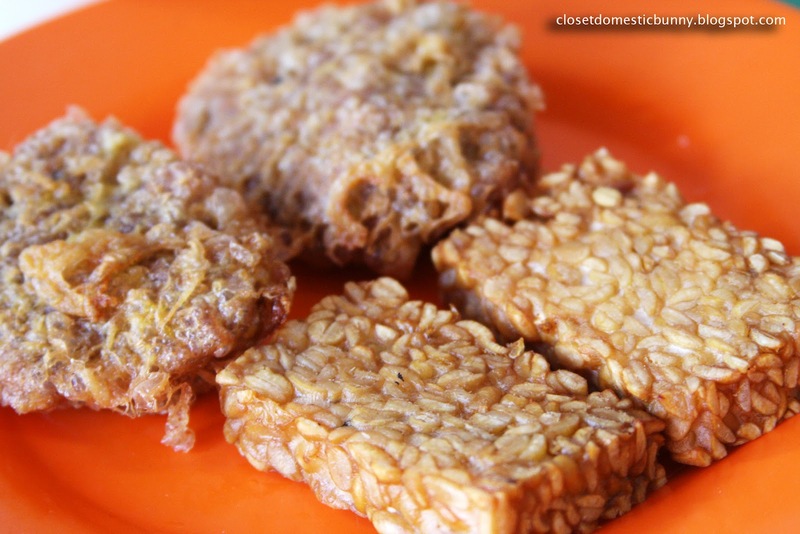 Though it is still firmly a javanese dish, using only spices and ingredients that can be found in java island. Warung Brintik's version is particularly strong in its use of nutmeg and cloves, but in saying that, it's not in the least overpowering. What is so special about the semur here, as with the rawon, is the cut of meat that Warung Brintik is using. The most commonly used cut of meat in semur is the brisket, when braised for a long time, it can get stringy and tough. But not so at Warung Brintik, here they use the chuck (also called shin) part of the cattle. Rich in connective issues and collagen, when braised correctly, these collagen would literally melt in the mouth. To amp it up even more, kikil (beef tendons) are also used in the dish, giving it the most supreme melt-in-the-mouth feeling. You can order your semur exclusively with tendons, this (almost) fat free version is what my mother would usually have. My preference is to have it with half tendons and half meat, beefy yet gelatinous at the same time. 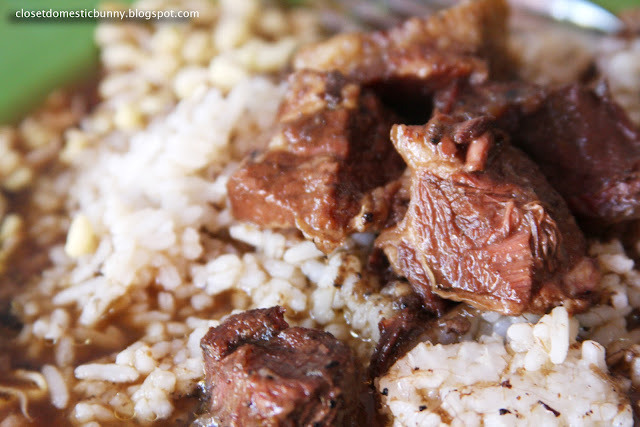 Rawon is a distinctly different dish to the semur for the following reasons. 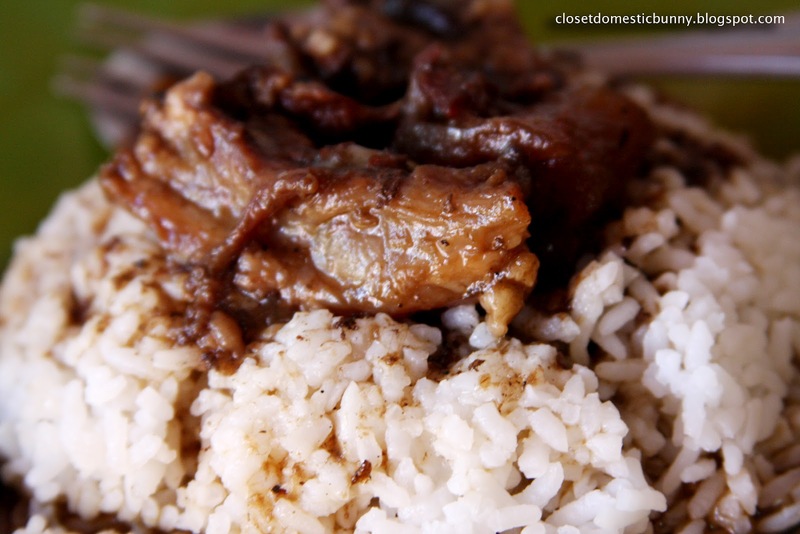 The beef in this dish is not braised, but boiled in a broth that has been blackened and spiced by the keluak fruit (pangium edule), highly poisonous when raw. 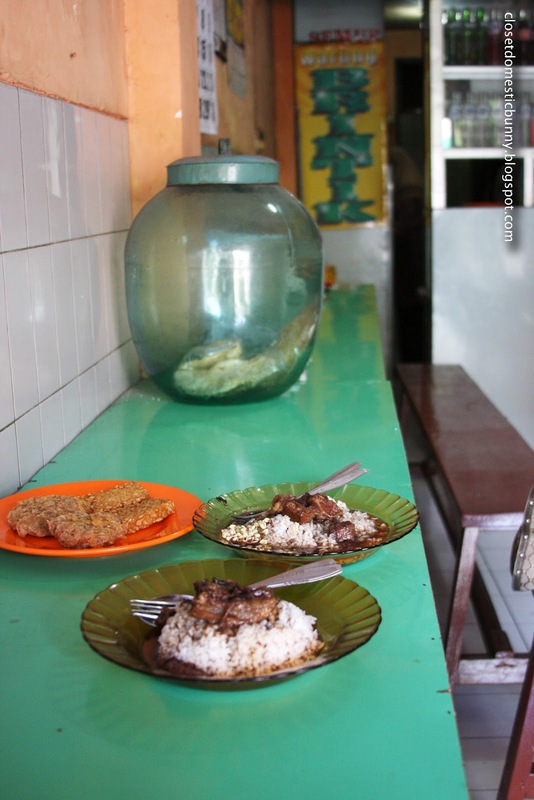 In Warung Brintik, where the semur is served with a thicker, mildly sweet sauce, quickly absorbed by the rice sitting below it; the rawon is served with not more than a ladle of the savoury black broth, but with enough run-off to surround the mound of rice. The rawon is served accompanied with a small handful of beansprouts. All of this time as I'm describing this to you, you might be wondering why these dishes consist of only rice and meat, no potatoes or carrots in sight. I am not so sure why myself, as this is very much the same everywhere in Malang. My own theory is when dishes are this delicious, why spoil it by adding anything else. The more likelier explanation is probably to do with the cost-effectiveness side of things. Although, there are no vegetables visibly shown in these dishes, when you order any dish in Warung Brintik, with your dish will also arrive a side dish of: tempe, fermented soybean slices that has been given the deep-frying treatment; and perkedel (also influenced by the Dutch), mashed potato patties that has been coated with eggs before shallow fried. When these side dishes tempt you enough to eat them, don't forget to let the proprietor know you've eaten them, as they are not included in the price of the main dishes. You wouldn't want to have a stomachache for eating without paying now, would you? If you're wondering how these dishes gotten so delicious, well, they've only been perfected since 1942. Warung Brintik was opened by the current owner's grandmother, Ibu Napsiah (no relation to the identically named person who started Depot Sulaiman). It is very much a family business. The second time I went to this place during my holiday, it was in the early afternoon, the place is empty, it was almost closing time, the proprietor's grandson was sitting on one of those long benches doing his homework. The proprietor was having a chat with my father, while taking down my order at the same time. Then, as we were eating our late lunch, the grandson sitting next to us, still doing his homework, a fitting scene for a family diner.